Embrace and drive innovation at your plant by laying a strong process foundation first. Survey results: How will AR/VR affect your workplace? In a small survey base, half of respondents say they are looking into adopting AR/VR technology. "Which pieces should be put together first to solve organizational reliability issues?" asks Tom Moriarty. In this edition of What Works, Frito-Lay partners with Georgia academy to create an industrial maintenance program. Leadership doesn’t exist in a vacuum. Here’s how to help senior and emerging leaders succeed. Don’t keep ’em grounded. Here’s how to let emerging talent soar. Phil Beelendorf, CRL, CMRP, Roquette America Inc.
Women are a vital part of solving U.S. manufacturing’s skills and leadership gaps. Tom Moriarty says leaders who delegate accountability introduce significant risk into the organization. How do you solve the skills gap? Ask next-gen workers. 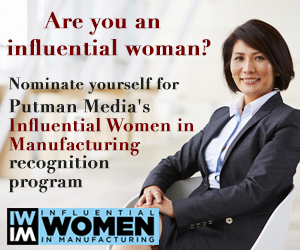 Who should be a member of the 2019 class of Influential Women in Manufacturing? Nominate a colleague or associate today. Tom Moriarty says when assigning tasks, always sink your teeth into process, oversight, and objectives. In this Big Picture Interview, Jake Mazulewicz, Ph.D., says focus on the root of the problem rather than on assigning blame. Rep. Haley Stevens of Michigan worked on manufacturing policy as an appointee under President Obama. Now she’s back in Washington, elected by suburban Detroit voters and with fresh perspective on manufacturing’s high-tech future. Managing teams that have been “doing this for decades”? Strive for mutual respect, says Tom Moriarty. Rendela Wenzel, a 2018 Influential Women in Manufacturing honoree, discusses keys to manufacturing’s future. In this Big Picture Interview, Amanda Saam explains why she left an industry job for a teaching role.